We’d love your help. 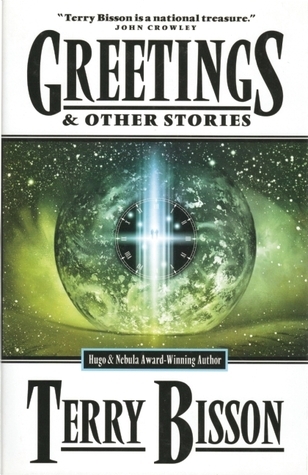 Let us know what’s wrong with this preview of Greetings by Terry Bisson. You’re about to face off with an Ashcroft van, break out from an assisted-dying facility, witness a volunteer crucifixion, endure a Neanderthal eviction, and journey to the end of time on a porch glider. Fearless, irreverent, and surprisingly optimistic short stories fill this collection from a science fiction veteran known for taking readers on a wild ride. Each of these You’re about to face off with an Ashcroft van, break out from an assisted-dying facility, witness a volunteer crucifixion, endure a Neanderthal eviction, and journey to the end of time on a porch glider. Fearless, irreverent, and surprisingly optimistic short stories fill this collection from a science fiction veteran known for taking readers on a wild ride. Each of these ten blazingly satiric short stories will leave you exhausted, outraged, and eager for more. The surreal adventures this time around include an escape from an assisted-death facility in "Greetings," a mystical journey to the end of time and back in "Dear Abbey," and "Almost Home," the story of a fantastical ride in an old-fashioned aeroplane. To ask other readers questions about Greetings, please sign up. To me, the mark of an excellent author is one who is able to write both novels and short stories well. I find that most authors are unable to do this, at least consistently. Even my favorite writers find me skipping a story here and there in their short story compilations. Not so, Terry Bisson. I am consistently captivated by Bisson's work and this compilation was no exception. From the beginning to the end, I was pleased to find engaging stories that fully engaged me, but allowed me to stop read To me, the mark of an excellent author is one who is able to write both novels and short stories well. I find that most authors are unable to do this, at least consistently. Even my favorite writers find me skipping a story here and there in their short story compilations. Not so, Terry Bisson. Great short stories from one of the best writers alive. Come Dance with Me may be my favorite short story ever. Incredibly creepy tale that merges alt youth culture, computer science and occult horror. Death's Doorstep is a poignant sad tale of our abandonment of the elderly, set in a world in which all seventy year olds are put to death. The other eight tales also have some gems. He's best known for his humorous science fiction, but these stories say he can do just about every other type of sci Great short stories from one of the best writers alive. Come Dance with Me may be my favorite short story ever. Incredibly creepy tale that merges alt youth culture, computer science and occult horror. Death's Doorstep is a poignant sad tale of our abandonment of the elderly, set in a world in which all seventy year olds are put to death. The other eight tales also have some gems. He's best known for his humorous science fiction, but these stories say he can do just about every other type of science fiction as a master. Terry Ballantine Bisson is an American science fiction and fantasy author best known for his short stories, including "Bears Discover Fire" (1990), which which won both the Hugo and Nebula awards, as well as They're Made Out of Meat (1991), which has been adapted for video often.